Biological control (pest suppression by predators and parasitoids) is a critical component of integrated pest management (IPM) for apple pests. Biological control is particularly crucial for management of woolly apple aphids (Eriosoma lanigerum) because they are difficult to manage with currently available insecticides. Previously, we interviewed apple orchard managers about the effectiveness of different predators for suppressing woolly apple aphids, and they clearly considered the European earwig (Forficula auricularia) as the least valuable. Apple orchard managers sometimes expressed concerns that earwigs directly damage apple fruits, but in fact, it is not clear whether earwigs cause damage or merely seek shelter in existing wounds. In contrast, many studies suggest earwigs are a key predator of woolly apple aphids. Given that earwigs are very common in apple orchards, there is a need to understand whether earwigs in apple orchards are a pest, a beneficial, or both. In this project, we quantified the positive (aphid suppression) and negative effects (fruit damage) of earwigs in commercial apple orchards, and compared the perceptions of interviewed managers with our field data. To accomplish this, we (1) manipulated earwig densities in commercial orchards, (2) analyzed earwig diets through molecular analysis of their stomach contents, and (3) conducted new in-depth interviews with apple orchard managers about their perceptions of earwigs. Our results provide clear evidence that earwigs suppressed woolly apple aphid populations without initiating damage to apple fruits. However, in our interviews, earwigs were not generally considered a key biological agent of woolly apple aphid, and several interviewees reported spraying insecticides to eliminate earwigs. 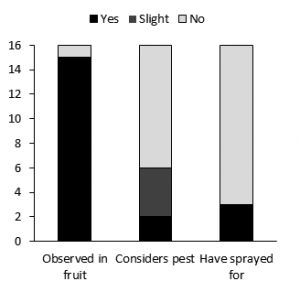 Taken together, our results suggest that greater appreciation for earwigs and consideration of their conservation in IPM strategies could improve woolly apple aphid biological control and reduce insecticide use. (i) Project Sites – One Gala and three Fuji commercial orchards were selected for study. They were located between Orondo and Royal City, WA. All were modern, high-density plantings on dwarfing rootstocks with a history of woolly apple aphid infestation. Sub-objective 1a: manipulating earwig densities – In May 2017, we divided each of the 3 Fuji orchard blocks (Fuji 1, Fuji 2, and Fuji 3) into 12 sections consisting of 8 trees in each of 2 adjacent rows. In each block, we designated four sections as “earwig release areas,” four as “earwig removal areas,” and four as “control areas” (4 orchards x 3 treatments x 4 replications = 48 total sampling areas). From May until November 2017, we counted earwigs in all sections using rolled strips of corrugated cardboard. Earwigs naturally move towards tight spaces, away from light, and are attracted to other earwigs, thus they aggregate in these cardboard shelters. One shelter (a 7.5 cm by 35.5 cm rolled strip of corrugated cardboard) was placed on each tree, and earwigs were shaken out into a bucket and counted weekly. In the earwig removal areas, all earwigs found were placed in plastic bags and transported to the laboratory. In the control areas, earwigs were counted and released onto the orchard floor. In the earwig release areas, earwigs were counted, released, and earwigs collected from our earwig removal areas and a different orchard were added. Between 31-May and 11-Jul, a total of 215 earwigs were released per tree at each augmentation section in Fuji 1, 140 per tree in Fuji 2, and 230 per tree in Fuji 3 orchards. The Gala orchard only had 10 control sections, monitored as above, but in 2016, five of these sections were treated as removal and the other five as augmentation sections. The augmentation sections at the Gala orchard in 2016 received ca. 46 earwigs per tree over the year. Sub-objective 1b: monitoring aphids – In each sampling area, we counted woolly apple aphid colonies on leaf axils of 10 twigs per tree, and all woody branch and trunk material (16 trees per sampling area) weekly from May until November 2017. Sub-objective 1c: monitoring fruit damage – During the harvest period in 2017, we inspected up to 30 apple fruits per tree in all earwig removal areas and earwig release sections at Fuji orchards 1 and 2, and all sections of the Gala orchard. Types of damage were recorded as: splits on sides of apples, depressions (limb-rub symptoms), russet patches, rounded holes on the sides of apples, irregular holes on the sides of apples, bitter bit symptoms, stem bowl splitting, and stem bowl splitting with rounded holes. Splitting was defined as an oblong exposure of internal tissue. Objective 1 statistical analysis – To assess the effect of our earwig abundance manipulations on earwig counts, we first calculated cumulative insect-days for the number of earwigs per shelter at each section of each orchard. Cumulative insect-days represent the amount and duration of insect occurrence in one expression as: ∑(Di + 1 – Di)[(Yi +Yi + 1))/2] where Di and Di+1 are adjacent observation time points (days) and Yi and Yi+1 are insect counts on those days. We then compared cumulative earwig-days within each site by ANOVA, with an explanatory variable of treatment, and response variables of cumulative earwig-days and cumulative woolly apple aphid colony-days. For the three Fuji orchards, which had three treatment types (earwig augmentation, control, and earwig removal), we followed ANOVAs with linear contrasts to compare each augmentation and removal treatment to the control treatment within each site. To more directly quantify the relationship between earwig abundance and woolly apple aphid abundance, we first divided cumulative insect-days of woolly apple aphid colonies and of earwigs by the number of days each section was monitored, to convert the values to a more relatable metric, essentially representing season-wide average insect counts. Then, for each orchard (and year for the Gala orchard), we plotted woolly apple aphid values by earwig values of each section and fitted a negative exponential function: Y = h + a*e-bx. We obtained maximum likelihood coefficients for this model using the ‘mle2’ function, and compared the support to a linear model (Y = s*h) and a null model (Y = h) using Aikake’s Information Criterion corrected for sample size (AICc) with the ‘AICctab’ function in the R package ‘bbmle’. To assess the effect of earwigs on fruit damage, we totaled the number of apples in each damage category into two groups: apples from earwig augmentation areas and apples from the earwig removal areas (from Fuji orchards 1 and 2) and and control areas (at the Gala orchard). We then compared incidence of each damage category between the two groups with Fisher’s exact tests. Sub-objective 2a: earwig collections – At each of the four sites (see Objective 1), we collected a sample of 20 earwigs within an hour of sunrise at four time points from 28 June to 3 October. Sub-objective 2b: detection of woolly apple aphid DNA in earwig guts – We dissected earwig stomachs and extracted DNA contents from each using a QIAGEN DNeasy extraction kit. Using woolly apple aphid specific primers tested and designed during this study (forward primer: 5’-GGAATAATTGGTTCATCCTTA-3’; reverse primer: 5’-CTACAAATTATTATTATTAAAGAAGGG-3’), we tested each extraction for presence of woolly apple aphid DNA with a simple polymerase chain reaction assay. Sub-objective 2c: earwig diet characterization with next-generation sequencing – First, for each earwig collection we pooled DNA into a single unit (4 sites x 4 earwig collections = 16 samples). Pooling was necessary because the cost of sequencing individual stomachs was too high. These samples were sent to a commercial laboratory, RTL Genomics (Lubbock, TX), for sequencing of arthropod, plant, and fungal DNA contents. Taxonomic assignments to resulting DNA sequences were made by the RTL Genomics laboratory following their standard methods. Sub-objective 3a: interview apple industry professionals – we conducted recorded interviews with 16 apple industry professionals. They were a mix of of private owners and consultants agreed to in-depth interviews about their perceptions and experiences who were solicited in 2016 at extension and industry meetings in central Washington. Sub-objective 3b: transcribe and analyze interviews – To analyze interviews, we first transcribed all audio to text. We then organized all relevant text into a table matrix by topic. In two areas, we summarized responses into categories. First, in interviewees’ “overall strategy for woolly apple aphid management”, perceptions on the role of biological control in general, and of each natural enemy, were categorized as either: ‘important’ (having a significant role), ‘mixed’ (having a role, but with uncertainty of its importance, or having an inconsistent role) ‘don’t know’ (lack of knowledge of its existence, or uncertainty that a potential role exists), or ‘not important’ (a confident assertion that there is no role). Second, we scored whether each interviewee had ever observed earwigs in damaged fruit, whether they had ever been in involved in a decision to chemically suppress earwigs, and whether they considered earwigs a pest. We rated interviewees’ importance of earwigs as a pest as ‘yes’ (caused significant economic damage), ‘slight’ (caused economic damage, but there was no concern about it), or ‘no’ (has not caused economic damage). Sub-objective 1a: manipulating earwig densities – Cumulative earwig-days in augmentation sections were greater than in control sections at the Gala orchard in 2016 (mean = 663 in augmentation sections, 7.9 in control sections, T = -43, P < 0.0001, df = 8). Despite no further manipulation, cumulative earwig-days remained higher in the augmentation areas relative to control sections in 2017 (679 in augmentation sections, 89 in control sections, T = -4.8, P = 0.0007, df = 8). In each of the three Fuji orchards in 2017, earwig augmentation sections had significantly more cumulative earwig-days than control sections (Fuji 1: mean = 981 in augmentation sections, 111 in control sections, linear contrast F1,9 = 27, P = 0.0006; Fuji 2: 1150 vs. 293, F1,9 = 36, P = 0.0002; Fuji 3: 1183 vs. 623, F1,9 = 10.8, P = 0.0095). Earwig removal sections tended to have fewer cumulative earwig-days than control sections, but the differences were small and not statistically significant (Fuji 1: mean = 21, linear contrast against control F1,9 = 0.29, P = 0.6060; Fuji 2: 128, F1,9 = 1.3, P = 0.2806; Fuji 3: 449, F1,9 = 1.03, P = 0.3367). These results show that it is possible to increase earwig abundance or establish a new earwig population by releasing earwigs into an orchard. Sub-objective 1b: monitoring aphids – For the three Fuji orchards, the negative exponential model was well-supported to describe the relationship between woolly apple aphid abundance and earwig counts (all ΔAICc > 13.6 over a null model). A linear model was superior for the Gala orchard in both years compared to the exponential model (ΔAICc = 4.7 in 2016, 1.4 in 2017), probably because of the low spread of earwig abundance within treatment types resulting in few intermediate values to be fitted in the model. Aphid abundance was lower as earwig abundance increased, with woolly apple aphid abundance leveling off at a low amount (Fig. 1). Fig. 1 Season-wide average earwig and aphid colony counts in earwig augmentation, removal, and control areas in 2016 and 2017 at a Gala orchard (a, b), and three Fuji orchards in 2017 (c-e). These results provide clear and direct evidence that earwigs substantially contribute to woolly apple aphid biological control. Sub-objective 1c: monitoring fruit damage Across the 6,005 total apples inspected in earwig augmentation areas versus the 5,945 apples inspected in earwig removal areas (in Fuji orchards 1 and 2) or control areas (in the Gala orchard), the percentage of apples with no damage was similar (95.9% versus 95.7%; Fisher’s exact test, P = 0.94). Incidence of all damage categories were similar between groups, except for apples with stem bowl splits where the splits appeared rounded off or had small round holes in the adjoining tissue were more common in earwig augmentation areas (0.3% versus 0.1%; Fisher’s exact test, P = 0.017). However, the overall occurrence of any type of stem bowl split was similar between groups (2.0% versus 2.2%; Fisher’s exact test, P = 0.44). These results provide no evidence that earwigs increased damage to apples. If they did, we would have expected more damaged apples in the earwig augmentation sections. At each orchard, woolly apple aphid DNA was always found in at least one earwig stomach for each collection date (Fig. 2). There was no clear pattern between detection rates and woolly apple aphid abundance and woolly apple aphid DNA was found even during periods when aphid abundance was very low. In the next-generation sequencing of earwig stomach contents, Fungi had greater diversity in the entire dataset (196 taxa) compared to animals (61 taxa) and plants (37 taxa). Pooled across all sites and sampling days, apple pests such as Campylomma verbasci, Lygus sp, and several aphids (Aphis fabae, Eriosoma lanigerum, Macrosiphum euphorbiae, and Myzus persicae) were detected, but so were beneficial arthropods such as Nabis sp, lady beetles (Hippodamia convergens, Psyllobora borealis, and Stethorus punctillum), Phalangium opilio, and a variety of innocuous Diptera, Coleoptera, and Hemiptera. The plant Sorbus sp was detected in all 16 field samples, but we believe this taxonomic assignment was an artifact of RTL’s standard method, and that these reads correspond to apple tree (Malus domestica) DNA. The COI region of Sorbus amplified by our primer pair has 100% similarity to M. domestica (in addition to several other Sorbus spp, Malus spp, and Rosaceae family plants). M. domestica seems the most likely identity as Sorbus is not expected to occur in our study’s region. Fig. 2 Woolly apple aphid colonies per tree (top row) and percentage of earwig guts testing positive for woolly apple aphid (bottom row) within one earwig augmentation section at each of four orchards at Gala 1 (a), Fuji 1 (b), Fuji 2 (c), and Fuji 3 (d) orchards. These results show that earwigs although earwigs could potentially ignore woolly apple aphids in favor of many alternative foods, earwigs found and consumed woolly apple aphids even when the aphids were sparse. This highlights the theoretical advantages of earwigs as biological control agents: compared to other predators whose abundance is dependent on pest population size, earwigs can persist when pest densities are low by eating alternative foods, and prevent the pest population from increasing in the first place. In sum, our results from earwig experimentation provide strong evidence that orchards with earwig populations will have reduced woolly apple aphid problems, and are unlikely to have significant problems from earwig damage to apples. Interviewees generally considered biological control was important for management of woolly apple aphids, but earwigs were reported as being important by fewer interviewees compared to lacewings, syrphids, coccinellids, and Aphelinus mali (a specialist parasitoid wasp), and reported as important more often only compared to Deraeocoris brevis (a predator hemipteran) and carabids (ground beetles) (Fig. 3). The most common opinion about earwigs as biological control agents was in the ‘mixed’ category. For other taxa, interviewees typically had a mixed response because they felt that a natural enemy did not provide consistent or great enough control, whereas for earwigs, the mixed response was usually because they felt that earwigs were likely a predator but were unsure how important they were. Fig. 3 Interviewee perceptions on the overall importance of biological control and of specific biological control agents in their overall strategy for woolly apple aphid management. For earwigs as pests, most interviewees reported that they saw earwigs in damaged apple fruits, but only about a third though that were earwigs were a pest (Fig. 4). This was because interviewees either thought that damage caused by earwigs was so rare that it was not significant, or because they believed that earwigs could only attack previously damaged apples. Nonetheless, three interviewees were very concerned about earwigs damaging apples and had been involved in a decision to spray insecticides to control them. Earwigs were most frequently mentioned as appearing in the stem-bowls of damaged apples, but calyx-end feeding and feeding on the sides of apples were also observed. Fig. 4 Interviewee responses on the pest status of earwigs. We suspect that the widespread uncertainty and mixed opinions about earwigs as biological control agents and as pests is related to their low visibility in the orchard. Earwigs are nocturnal, and no one reported to directly observe them feeding on aphids or initiating damage to fruit. Therefore, it is difficult to connect their presence to their true effects. In 2017 and 2018, graduate student PI Robert Orpet presented data from this project to multiple audiences consisting of tree fruit growers, consultants, managers, and other researchers. Presentations included talks at the Orchard Pest and Disease Management Conference in Portland (OR), the Science in our Valley Seminar Series in Wenatchee (WA), and industry meetings in Okonagan (WA), Kennewick (WA), Chelan (WA), and Wenatchee (WA). Orpet also shared information on earwigs as biological control agents at a farm walk in Quincy (WA) organized by WSU and the Tilth Alliance. Orpet has received several inquiries on managing earwig populations, and press coverage by Wenatchee World newspaper, Fruit Grower News magazine, Western Farm Press, and WSU internet newsletters. Video footage of an earwig destroying a woolly apple aphid colony shared at meetings and in news articles has reached over 180 views as of August 2018 (video here: https://www.youtube.com/watch?v=sSFakIgkfMI). Orpet is currently preparing an article targeted at apple industry professionals on the effects of earwigs and how to manage them, which will be submitted to the Journal of Integrated Pest Management. In addition, two peer-reviewed journal articles on earwig research described in this report are in preparation for submission to academic journals. We predict that fewer orchardists will target earwigs with insecticide sprays after hearing the results of this project. Others may modify their pesticide programs to conserve earwigs, resulting in better aphid control. A reduction in pesticide use has potential environmental, human health benefits, economic benefits. Because of the 1-year duration of the project, we do not yet know how this project has affected sustainability, but three orchard managers have contacted Robert Orpet for advice on earwig population establishment and augmentation, and most of the interviewees in this project indicated they gained knowledge and were interested in the potential benefits of earwigs in conversation after the formal interview. During this project, I (Robert Orpet) learned about sustainable agricultural change by working with grower-collaborators for research sites, from interviewing industry professionals, talking to orchardists interested in incorporating earwigs in their integrated pest management strategies, and synthesizing these experiences with study of literature. Almost all of my interviewees worked with some acreage of both conventional and certified organic apple orchards. Regardless of management style, my interviewees wanted to farm in a sustainable way. But during this project I developed an awareness that sustainable management practices (such as soft pesticide programs which conserve biological control agents) will only be adopted if they are perceived as effectively addressing many potentially competing management goals and if they are compatible in the context of the larger agricultural operation. Tactics involving causes and effects that are easily visible and clear-cut are also more likely to be more adopted. Based on my research results, I believe that establishing and conserving earwig populations in apple orchards will result in decreased pesticide use and better control of aphid pests. However, it is a challenge to promote this view because: (1) the cause-and-effect relationships involving earwigs are not visibly obvious because you rarely will observe nocturnal earwigs eating pests but they are noticeable in damaged fruit during the day (2) monitoring and manipulating earwig populations is labor-intensive. Keeping this in mind, when I presented my research data, and while preparing an educational article on earwigs, I tried to give clear and direct evidence on the effects of earwigs (including showing video footage of one eating a woolly aphid colony), and present a very simple monitoring strategy to assess whether an orchard had earwigs or not as a first step in incorporating them in integrated pest management strategies. Through this, I developed skills in advocating change and I will continue to build skills in this area.